Canon David Paul is the Dean of the Cathedral of St John the Baptist. This means that he represents the bishop in the running of the Cathedral Church. Born and brought up in the north-east of England, Canon Paul began his career as a teacher. Later in life he heard the Lord’s call to follow him as a priest and has since served in many parishes in East Anglia. Canon Paul is a member of the Bishop’s Council as well as being involved in many other areas in the life of the Diocese. Fr Henry was born in America and lived in Texas until his family moved to Bury St Edmunds when he was twelve years old. 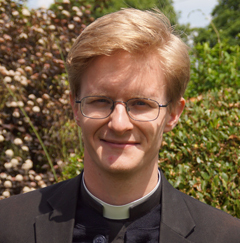 After a degree in English literature followed by a year in community in a parish in central London, he returned to apply to East Anglia and was ordained in the Cathedral in 2013. He spent time as a curate in Cambridge and King’s Lynn before being appointed to the Cathedral Parish. Fr Seelan born in Chennai, India on 14 th October. Did his seminary training in Bangalore. Was ordained priest on 16 th April 2005. Served as missionary in East Africa. Here at the cathedral he is involved in hospital chaplaincy.